Home World: "Spacer", born on a ship. Next of Kin: Mother and Father, location unknown. T he story of Lulany is not a very exciting one. She grew up on a trade ship with both her loving parents. She was the daughter to a merchant who was quite successful at providing credits for his family. Lulany was shaped since birth to also become a merchant, though it became skewed as she aged and learned more of the universe and how credits pretty much ran it. 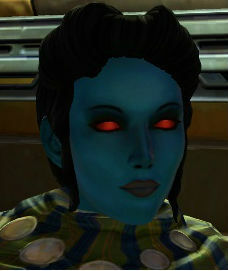 She became just shy of obsessed with making credits, learning basic trade skills from various planets as they traveled. When she got a bit older. it was decided that her father was not ready to step down from his merchant store and that Lulany was not yet prepared to take over. This did not upset her as much as she thought it would, as it gave her a chance to venture out on her own and make her own credits. Though it was promised that when she returns home, the family store would be passed to her name. M ost of the skills she learned were quite bare-bones. The absolute bare minimum was learned of that trade. She did, however learn a lot in medical. She thought it would be easy as the droids do most of the work and medical seemed to be a really hot payday for mercenary groups. Though she chose medical to be the trade skill she learned most in, if you ask her to do anything else (with the right amount of credits) she will most likely do whatever it is you want her to do. Though warning, because of how much she lacks the skills in the other trades, the result of the work will probably be crap! Despite that, she has not lost sight of being a merchant first and will always work to that end. L ulany is quite predictable and often finds herself in situations where even she says to herself "Yeah, I figured I'd end up like this". She has a straight forward personality and sees the world logically, which on VERY rare occasions has led to some argumentative responses from others. Despite that, she is normally a very neutral tempered person who has genuine care for the people around her.